Just around the corner from Kahului Airport is Kanaha Beach Park, a remnant of a vast ecosystem that spanned the coast of Waihee to as far north as Hamakuapoko and even inland to Waikapu. The long stretch of land included natural white-sand beaches, coastal dunes and wetlands. Kanaha Beach Park provides a unique sense of place for Maui. This 84-acre contiguous habitat provides a bounty of natural resources such as coastal estuaries and sprawling dune systems – a natural home for Maui’s endemic and indigenous flora and fauna. The beach park adjoins the 143-acre Kanaha Pond, the second-largest wetland on Maui and a nationally recognized wildlife sanctuary, which serves as an important breeding area for endangered Hawaiian waterfowl. In recent years, this sensitive natural area has suffered badly from the impact of visitors trampling the dunes. The area also suffers from erosion, with Maui having the highest coastal erosion rate in the state. Officials are now faced with the task of finding the balance between recreation and preservation. For years, volunteer groups and individuals have worked to restore the dunes and bring back natural vegetation. Sand fencings have been installed and dedicated foot paths and parking areas established. On Aug. 12, in response to recent concerns raised by area volunteers regarding unpermitted paving of the dunes, the Maui County Council’s Economic Development, Energy, Agriculture and Recreation Committee held a meeting and conducted a panel discussion on Kanaha Beach Park dune preservation. Participants included representatives of Maui Green & Beautiful (formerly known as Maui Outdoor Circle), Keep the Hawaiian Islands Beautiful, and the University of Hawaii-UH Sea Grant College Program. Panelists informed the committee that motor vehicles often drive on sand dunes, crushing native plants and polluting sand with oil. Dedicated footpaths are frequently ignored, and beach users create their own access to the ocean. In 2001, the county procured services to prepare a Kanaha Beach Park Master Plan. A 92-page draft plan was submitted in 2004 and has yet to be completed or accepted. Review the draft plan at www.mauicounty.gov/kanahaplan. Recognizing that the absence of a final plan is an impediment to preservation, the council appropriated an additional $250,000 in the current fiscal year to complete the plan. A finalized plan will provide guidance to government agencies, community groups and concerned individuals while ensuring a process and road map for all preservation efforts. 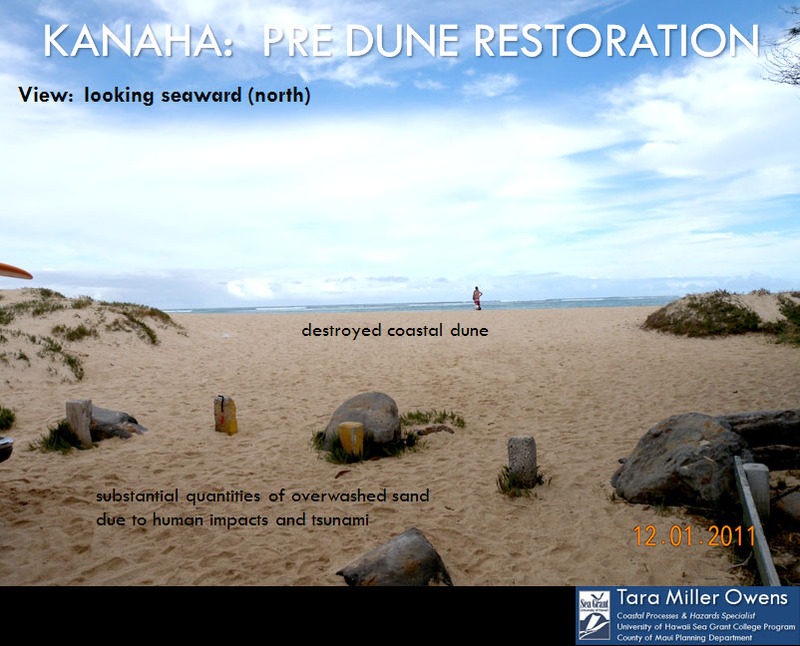 Kanaha Beach Park is a special place, and we have an opportunity to preserve it. 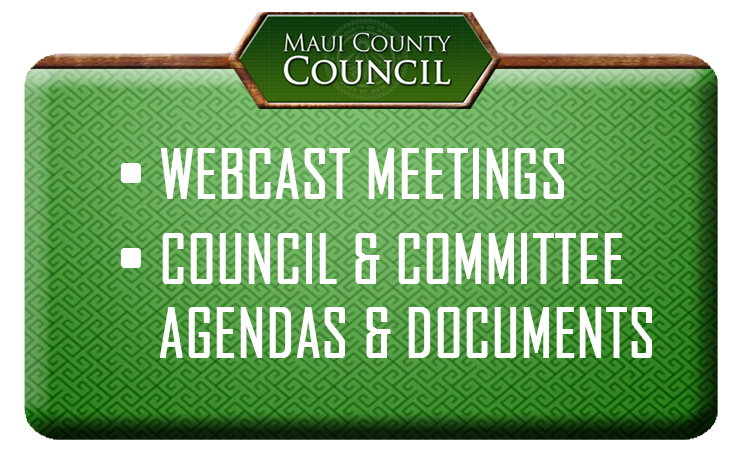 Submit your concerns and ideas to ear.committee@mauicounty.us, referencing EAR-46. 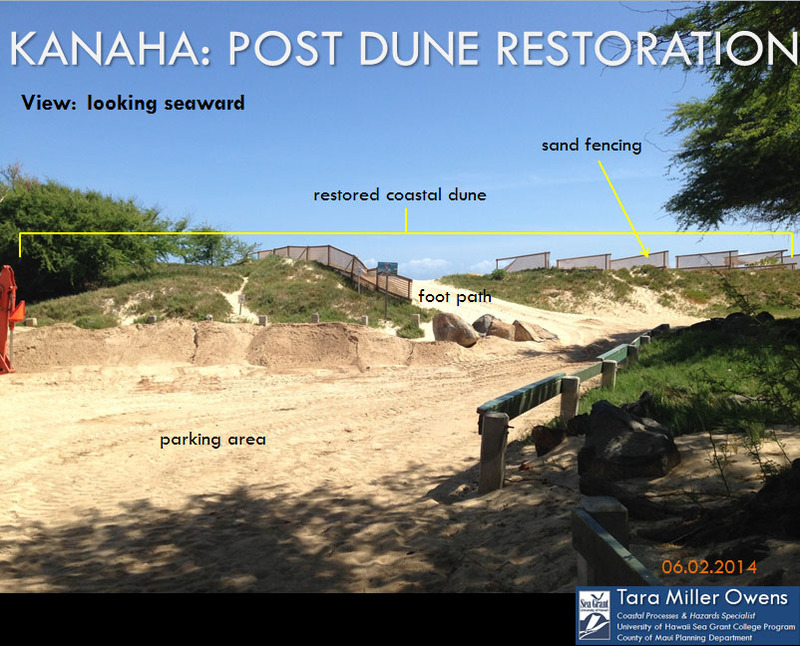 For individuals and community groups interested in volunteering with dune restoration projects, please contact Tara Owens at taram@hawaii.edu. * Don Guzman holds the County Council seat for the Kahului residency area. He is chairman of the council’s Economic Development, Energy, Agriculture and Recreation Committee. “Chair’s 3 Minutes” is a weekly column to explain the latest news on county legislative matters.